At the heart of Franciscan spirituality is a profound respect for the interrelatedness of all creation. 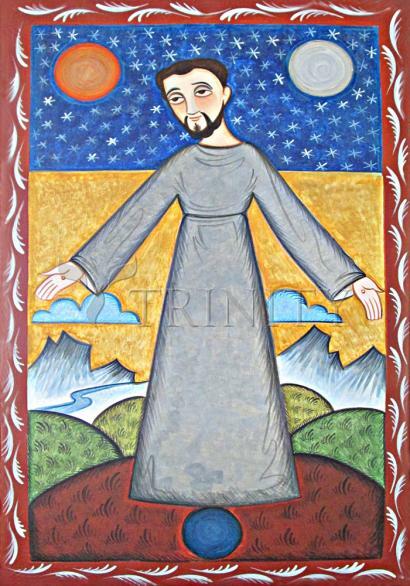 St. Francis of Assisi believed that since God was the Father and Creator of all, he was a child of God, and therefore a sibling of every creature, every element, and every part of creation. In his Canticle of the Creatures, a song of praise that he wrote as his death drew close, Francis named some of his sacred siblings: Brother Sun, Sister Moon, Brother Fire, Sister Wind, and even Sister Death. Today we know that the universe is immense. We know that Brother Sun is simply one of billions of stars, and that Sister Moon has many sisters. Voyages into space have revealed that the world we inhabit is a tiny speck within a vast, galaxy-filled universe. The birthing and dying of stars, the mystery of dark matter and dark energy, and the proven reality of a universe still expanding from the initial flaring forth over 13.5 billion years ago invite us to explore anew our place in this unfolding universe. Similarly, we know also the destruction that has occurred because humanity thought it had a right to dominate creation. We are lamenting the pollution of our Sisters Water and Wind, and the exploitation of our Mother Earth. The imbalance in the ownership and use of the earth’s resources, and the wastage of uncountable billions in wars and armaments, reveal that in our own day the respect and sense of responsibility for the other that comes with a deep sense of relatedness is wanting. The loss of relationship with much of creation has led us to a loss of reverence and respect. St. Bonaventure said that our understanding of God is linked to our understanding of creation. Born of the same matter as the stars and the galaxies, and living within a universe that is still expanding from the initial flaring forth of energy and light, we must discover ourselves and our God within this new cosmology. We are challenged to deepen our understanding of the interrelatedness of the cosmos. As followers of Francis, we seek to open ourselves to a new understanding of the God who is Mystery. We embrace anew the Christ who existed in God from all eternity: the creative energy of God, which was revealed from the moment of God’s intention to create the universe, the Word. This is the cosmic Christ, who took flesh in our world in Jesus of Nazareth. Let us sing a new song for our time: a song of the sacred siblings, a canticle of the cosmos!